Breast stretch marks are purple or red linear marks which turns into white or silver lines with time. Breast stretch marks may appear at any age but most common in pregnant or breast feeding women. During puberty, breast stretch marks are also quite common in teenage girls due to increased hormonal production and rapid breast growth. 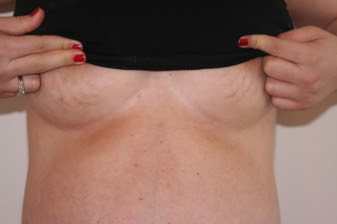 When breast starts developing at a faster rate even more than the skin layers can support then elastin fibres on the middle skin layer start tearing due to overstretching and result in the formation of linear stretch marks under the top layer of the skin and appear as breast stretch marks. Although stretch marks cannot be completely removed but there are some home remedies that can be used to lighten them and hide their appearance. Massage your breasts with cocoa butter.It is considered best to fade away stretch marks because it stimulates blood flow to your skin and increases collagen production. An increase in collagen restore the skin elasticity and hence fade or almost cure stretch marks. Regular application of cocoa better during pregnancy prevents the appearance of stretch marks on belly and breast. Regular application of Vitamin E Oil also fade stretch marks because Vitamin E works as an antioxidant to protects skin from collagen breakdown and also prevents the appearance of further stretch marks.Pierce the Vitamin E capsule with a clean needle and apply the contents on affected areas.Massage the skin in circular motion to increase the blood flow towards affected areas and also increase collage production and reduce stretch marks. You can use olive oil or almond oil for massaging your skin because they also contain a rich amount of Vitamin E. Massage the affected skin areas with either of these oils and repeat this process on a daily basis. Regular application of Aloe Vera gel over the affected areas also helps significantly lighten the appearance of stretch marks. Simply extract the fresh aloe vera gel from aloe vera leaves and apply on affected areas. Gently massage in circular motions for few minutes. Finally wash off with lukewarm water after 30 minutes. Mix together 1/4 cup aloe vera gel and 1/2 cup olive oil. Now by using a needle or sharp edge, pierce 6 vitamin E capsules and 4 vitamin A capsules. Squeeze the capsules and add the contents to the aloe vera gel and olive oil mixture. Now mix together all the ingredients and apply the desired mixture on affected areas and store the rest of mixture in refrigerator. Wait for the mixture to be absorbed completely by your skin. Let it stay on your skin at least for 20 minutes and then wash off. For best results repeat this process on a daily basis. A mixture of lemon juice and cucumber juice is also very beneficial in fading the appearance of breast stretch marks. Take equal amounts of lemon and cucumber juices. Mix them well and apply on the affected areas. Let it absorb into skin and then wash off after half an hour. To reduce the appearance of breast stretch marks, take 1 tablespoon of lemon juice and mix with 1/2 teaspoon of glycerine. Gently rub the mixture on the affected areas. Repeat the process on a daily basis until you get the desired results. Potato juice is rich in many essential nutrients including important vitamins and minerals which are very helpful in stimulating collagen and elastin synthesis which are responsible for maintaining and restoring the skin smoothness and elasticity and hence aids in fading away your stretch marks. Take a medium size potato and cut this into thick sized slices. Now take a freshly cut potato slice and rub it gently over your stretch marks. Continuously rub this until the juice is fully absorbed by skin. Leave it for 10-15 minutes and then wash off with lukewarm water. Increase the intake of Vitamin C in your diet because it increase the production of collagen and maintain skin's elasticity and prevents stretch marks. Important sources of Vitamin C are oranges, tangerines, limes, guava, lemons, papayas, strawberries, black currants, grapefruit and mangoes. Many vegetables contain Vitamin C including collard greens, green and red peppers, broccoli, tomatoes, brussel sprouts, cabbage, potatoes, kale, spinach(palak), and watercress. Massage of Vitamin C serum on affected areas also fade the appearance of stretch marks. not drinking enough water or not keeping the skin hydrated also can result in the development of stretch marks. Try to drink at least 8-10 glasses of water on a daily basis. Well hydrated skin not only detoxifies your body but also restores the lost elasticity of the skin.